‘Justified’ is a popular American television drama series about cops, detectives and justice. It’s one of America’s favorite plots of movies and TV series. During five years ‘Justified’ was shown on FX and rapidly won highest reviews from the audience. Walton Goggins who played Boyd Crowder in the series showed his professional acting talent which made him one of the most popular characters in the series! Walton Goggins received enormous critical acclaim for his riveting portrayal of ‘Detective Shane Vendrell’ on FX’s gritty, award-winning drama series, The Shield. In 2009 he was nominated for a Television Critics Association (TCA) Award in the category of Individual Achievement in Drama. In addition, New York Magazine singled out his performance as one of the highlights of television. Entertainment Weekly, TV Guide, Variety, and The Hollywood Reporter all consistently listed Goggins as their choice for an Emmy® nomination. In the fall of 2008, The Shield ended its successful seven-season run, earning the honor of #1 in Time magazine’s Top 10 Television Series, as well as being named one of AFI’s Top Television Programs of the Year for 2008. When he plays Boyd Crowder on FX’s wildly entertaining “Justified,” Walton Goggins is the charming face of evil, the yin to the yang of Timothy Olyphant’s Raylan Givens. The TV series consists of 6 seasons. First season introduces the audience with the main characters and the storyline. Deputy U.S. Marshal Raylan Givens is a 19th century-style but modern-day officer, who enforces his brand of justice which puts a target on his back with criminals and puts him at odds with his bosses in the U.S. Marshals Service. As a result of his having eagerly shot a Miami fugitive in a "justified" shooting in his South Florida assignment, he gets reassigned to the district covering his rural Eastern Kentucky mining hometown of Harlan County. The Second season finds Boyd Crowder dead, and the Crowder criminal grip on Harlan County broken. Deputy U.S. Marshal Raylan Givens must now face off against the criminal organizations that are moving to fill the void, and finds himself entangled once again with the mercurial Boyd Crowder. The third season takes place three weeks after the events of the Season 2 finale "Bloody Harlan". Deputy U.S. Marshal Raylan Givens has to face off against two new adversaries: Detroit crime boss Robert Quarles, who looks to come to Kentucky to take over the Dixie Mafia and the Oxycontin business, and Ellstin Limehouse, the omniscent protector of Noble's Holler who will do anything to keep the bloodshed away from his sacred territory. This season also finds Boyd Crowder and his crew also looking to seize the Oxy business and Kentucky for themselves, and pits them in a rivalry against Quarles. The fourth season takes place two months after the finale of the Season 3 finale "Slaughterhouse". Deputy U.S. Marshal Raylan Givens finds himself in the middle of a dark, 30-year old mystery that involves his father Arlo. Boyd Crowder gains a new ally in Colton Rhodes, a former military policer who jailed him several times in Kuwait, but finds new rivals in Billy St. Cyr, a popular new preacher whose burgeoning congregation is infringing on Boyd's Oxy customer base, and Cassie, Billy's sister who also helps out with his mission. Boyd finds that his quest to reach Harlan high society has its own debts when he quickly becomes embroiled with the deadly Detroit mob. The fifth season finds Deputy U.S. Marshal Raylan Givens squaring off with the Florida branch of the Crowe family, headed by Daryl Crowe Jr., Dewey's cousin, hoping to make a permanent stay and impact in Kentucky, but Raylan is determined to rid Kentucky of Daryl and his siblings once and for all when they begin to make trouble. Boyd and Wynn Duffy's struggle to gain control of the heroin business leads them to deal with the deadly Mexican cartel, while Boyd must do whatever he can to free Ava from prison. The sixth season finds Deputy U.S. Marshal Raylan Givens teaming up with Rachel Brooks, Tim Gutterson and David Vasquez in a RICO case to bring down Boyd for good. Meanwhile, Boyd Crowder must revisit his bank robbing days at the behest of Wynn Duffy and Katherine Hale, while a legendary Kentucky gangster named Avery Markham comes back to his home state to win back the love of his life and become the marijuana kingpin of Harlan with a crew of menacing mercenaries. We have reminded you about all the seasons. So if you haven’t already watched it, but you are looking for something interesting to watch or you simply have a free time, you will surely enjoy its series! The finale has come! “Justified” was filmed in traditional American style, to some extend it more resembles Western-style. The first series and its extremely talented and charming heroes were immediately able to win the audience over. “Justified” ends its six-season run in a manner befitting the spirit of the series, its protagonist Raylan Givens, and, certainly, author Elmore Leonard. That is to say: on its own terms and with its own unique voice. As such, in its final episode, as it has done all season long by parading supporting characters in and out with astounding emotional precision, ‘The Promise’ splashes around in the series’ most prevalent theme: the captivating sway of the past, and the way in which legacy – both the kind a person has to contend with in their surroundings, and the looming question of what his or her own will be – acts as motivation. Because of its thematic concerns and its storytelling aspirations, the finale could have felt bogged down with the sheer amount of season 6 plot it still had left to wrap up, let alone the big sweeping story arcs concerning Raylan, Boyd, and Ava that its been dealing with since the premiere all the way back in March of 2010. Like its characters, though, Justified has always been unassuming and almost preternaturally self-aware – and as the series has done all season long, the finale came and went with the kind of efficiency and commanding presence too few finales do. The result of the show’s high emotional intelligence leads to some surprising decisions right off the bat – the kind that starts with Raylan spending a good chunk of time getting a taste of his own medicine from a cop who carries himself with the same kind of “I don’t care about your problems” swagger as the hat-wearing deputy marshal. It’s an unexpected move, considering just how many characters there are deserving of some screen time. But the episode makes it worthwhile in the way the series has throughout its run: by delivering great dialogue to go along with all the great performances. The exchange between the arresting officer and Raylan colors the latter’s character by providing one of many examples of how he’s changed since we first met him. It also lets Timothy Olyphant convey Raylan’s thoughts on his predicament through facial expression alone. There’s as much disbelief and agitation on Raylan’s face in the back of that squad car as there is sheer joy whenever he finds himself face-to-face with an ice cream cone. You can also add the child-like pleasure in Raylan’s smile when Art hands him back his badge and gun to the incredibly long list of reasons why Olyphant embodied his character like no one else possibly could. The reliance on an actor’s ability to say a thousand words with a single expression also speaks volumes about the finale’s sense of economy. With Boyd digging holes and throwing sticks of dynamite at law enforcement, Ava winding up in Avery’s menacing grasp, and Raylan working to prove he’s still operating on the side of the law, one might think ‘The Promise’ had bitten off way more than it could chew. But aside from a few quibbles with regard to convenient placement of characters, the episode worked splendidly. It worked by putting the emphasis on the trio who started the whole thing; namely, Raylan, Boyd, and Ava. So even if Boyd and Raylan tracking down Ava and Avery to the barn within minutes of one another seemed just a smidge too tidy, the emotional payoff of that pulse-pounding sequence was so high and demonstrative of the show’s superlative character and dialogue work, it doesn’t really matter how they got there. They could have beamed both men there and it wouldn’t have diluted the efficacy of the exchange one iota. With Avery proving to be an ineffectual bully, easily brought down by the unpredictable and irascible Boyd Crowder, the barn sequence (and the rest of the episode, actually) has all the room it needs to become the showdown the series has been building towards since it first yelled, “Fire in the hole!“ And it does become a showdown, but not in the sense a series that began the way Justified did would lead you to believe. In the pilot episode, Raylan sets up a situation where he can justifiably kill gangster Thomas Buckley (Peter Greene), and he does so, presumably without losing a wink of sleep over it. The mirroring of that situation in the barn is astounding, as Raylan kicks a loaded weapon to his nemesis and compels him to draw. But unlike Buckley’s murder, the scene is layered with an emotionality that goes beyond the notion of Walton Goggins having been such a force to reckon with for six seasons. Instead, it rests on the choices both men face. Raylan will either kill Boyd or he won’t. Boyd will either die by Raylan’s hand or live with Ava’s words explaining her betrayal echoing around in his skull for years to come. And in the end, they find themselves unwilling and unable to enact violence on one another because, as Boyd says later, “We dug coal together.” That bond is so specific to who these characters are, it fittingly and powerfully mines the very essence of show. Raylan and Boyd may have been defined by their enmity for one another, but it’s their Harlan-ness, the thing that, despite all their efforts to prove otherwise and to escape from, which ultimately defines them. It is that Harlan-ness that pushed the characters and the finale to a place beyond the surface of its characters. And as appropriate as it was that Boyd ended up being carted off in handcuffs, rather than a body bag, writers Graham Yost, Fred Golan, Dave Andron, and Benjamin Cavell still delivered the violent showdown fans of the series were likely anticipating. To that end, Jonathan Tucker’s Boon became the rare late-season addition that paid off. Boon’s obsession with the deputy marshal and his quick-draw skills telegraphed the showdown from the get-go. And while we all saw it coming, the outcome remained surprisingly opaque. After the shots of Raylan’s grave being dug up, and hints of his not being a father to his baby girl, it seemed possible that the series might head towards a darker, more solemn conclusion – one where a brash, youthful adversary bests the matured Raylan Givens. Instead, Boon’s own gun-fighting technique (going for the headshot) does him in, closing out Loretta McCready arc in style. That’s not really surprising. FX’s modern day Western was always fleet-footed and sharp. Even when it stumbled (as it did in season 5), Justified gave its audience something to remember, something to hold on to, whether it be a particularly catchy line of dialogue or an unexpected action or consequence. And in that sense, ‘The Promise’ feels very much a part of that overarching tenet of unassuming, and incredibly pleasing entertainment. This is made evident in Wynn Duffy’s final appearance, and how Raylan says goodbye to Rachel, Tim, and Art by calling to mind meaningful encounters from their past. Art gets to acknowledge Raylan for catching Boyd (the right way), while Rachel comments on his new hat (courtesy of Boon), as she when the two first met. Raylan even feeds Tim’s love of books by handing off his tattered copy of The Friends of Eddie Coyle (a nod to Leonard‘s appreciation of the book). If you had to find a word to describe ‘The Promise’ it would probably be: satisfying. Time jumps can be tricky, but seeing Raylan back in Florida, spending time with his daughter, and being okay that Winona has moved on (to a mustachioed Jason Gedrick) actually speaks to the character’s aforementioned maturation over the past six seasons. Raylan’s gone from angry to just stubborn, which from what we know about him is the emotional equivalent of scaling Mount Everest. It’s the kind of change that justifies his refusal to take Ava from her home and son in California, and his need to engage in some soulful banter with his nemesis one last time. 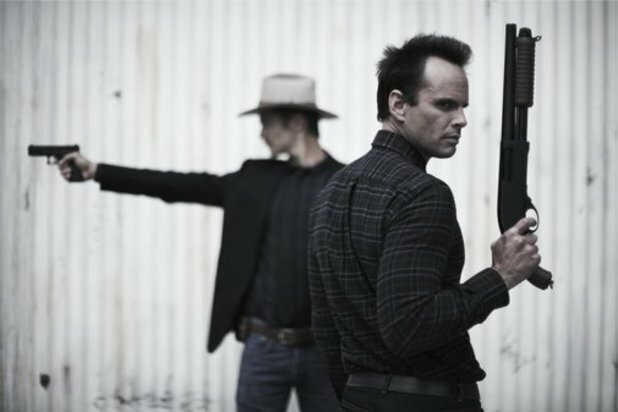 To end with Raylan Givens and Boyd Crowder acknowledging their past, while being fully committed to their present (and future) is about as satisfying and distinct an ending as Justified could have possibly mined from six seasons of terrific storytelling. The show will be missed, but with a final season this good, it will be a series worth revisiting for years to come.